Pimp My Carnival Ride: Gas-Powered Bumper Car! Ah, the California State Fair. Apparently, there are all sorts of things happening at Cal Expo; wine contests, cattle judging, etc. But the main things we remember are concentric design painted on the water tower, the late-summer Sacramento heat and of course, the midway. And while at some point in our early teens, the Tilt-A-Whirl began to make us queasy, bumper cars have never lost their potential for fun. 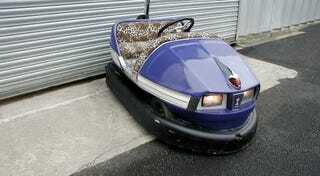 But what if one had a bumper car that wasn't dependent on an overhead electrical grid? What if it had say, some type of Honda motor in it? One UK man has built exactly that. Can we get ours with VTEC?